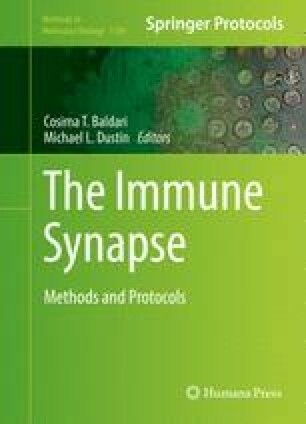 The immune synapse (IS) is a specialized structure that enables cell-cell communication between immune cells. As such, it involves direct cell-to-cell contact. It is sustained by cytoskeletal components that allow the intracellular polarization of different organelles and the surface re-organization of signaling and adhesion receptors. The tubulin-based cytoskeleton is a key player in IS formation and signaling. We describe methods to analyze through Western blot and microscopy analysis the polarization to the IS of the centrosome, also known as microtubule-organizing center (MTOC), the dynamics of microtubule growth and polymerization from the MTOC to the IS and the activation of signaling molecules. We thank Dr. Miguel Vicente Manzanares for critical reading of the manuscript. Optical microscopy experimentation has been conducted at the Microscopy & Dynamic Imaging Unit of the CNIC (Centro Nacional de Investigaciones Cardiovasculares) and at the Microscopy Facility of the IIS-IP (Instituto Investigación Sanitaria-Instituto Princesa), Madrid, Spain. This study was supported by grants SAF2014-55579-R from the Spanish Ministry of Economy and Competitiveness, INDISNET-S2011/BMD-2332 from the Comunidad de Madrid, ERC-2011-AdG 294340-GENTRIS Red Cardiovascular and RD 12-0042-0056 from Instituto Salud Carlos III (ISCIII). The Centro Nacional de Investigaciones Cardiovasculares (CNIC, Spain) is supported by the Spanish Ministry of Science and Innovation and the Pro-CNIC Foundation.